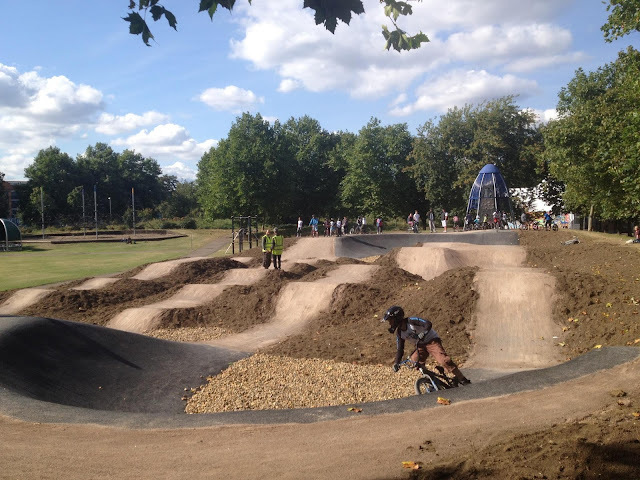 A fantastic new BMX track has opened in Mile End Park. It is open to the public and used several times each week by Tower Hamlets BMX Club, both for club sessions and sessions with local schools, youth clubs and community groups. The track will also hold competitions as part of the London BMX Time-trial Series and between school teams from across London. The Tower Hamlets BMX club meet every Saturday from 1pm-3pm for BMX coaching sessions at the track which is off Burdett Road in the section of the park between the Leisure Centre, Ariana Afghan restaurant and the hockey astro courts. Sessions cost £2 for members (membership is £10 per year with a free club t-shirt). There are limited bikes and safety gear available to use. This track is the fifth BMX track to open as part of Access Sport’s BMX Legacy Project with a new community BMX club and a brand new track being created in each of the Olympic host boroughs. Both the BMX Legacy Project and the Mile End track received financial support from Tower Hamlets Borough Council and the Mayor of London's Sports Legacy Programme.